Dr Andrew Scholey and Dr David Kennedy, from Northumbria University, made capsules of dried lemon balm grown locally and gave them to a group of 20 volunteers. They then carried out memory tests one, three and six hours later. There was no effect on working memory - the constant recall of continual events during the day. But secondary memory, the ability to learn, store and retrieve information, was improved. The findings were presented to presented to the British Psychological Society's annual conference in Bournemouth. 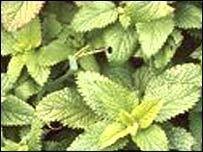 Dr Scholey said it was too early to say whether lemon balm might help Alzheimer's sufferers, but said: "It may help conditions where the memory is fragile."